Gannon University’s Recreation and Wellness Center (RWC) is having its 14th Annual Wellness Fair on Tuesday. 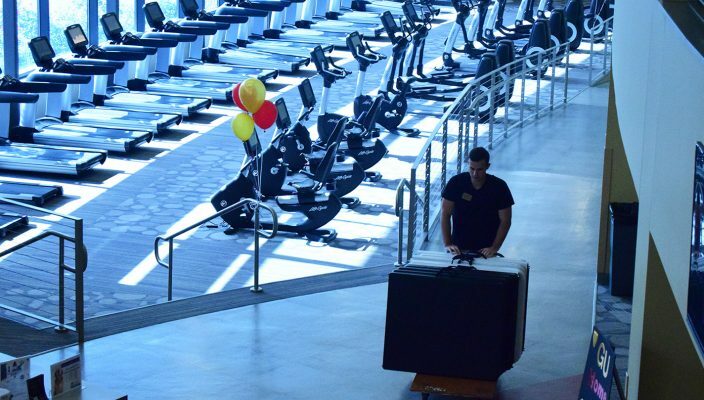 The Wellness Fair is the largest event that the Recreation and Wellness Center puts on every year so that members of the community have the opportunity to look at their own wellness journey. A multitude of vendors will be there in all of the zones of wellness that the department offers, including environmental, spiritual, intellectual, physical, social, emotional and occupational. There will also be an inclusion of student organizations and engagement activities that many will be excited to partake in. Located in our intellectual zone will be information about Gannon’s T.R.A.V.E.L. program and how students can have the opportunity to travel abroad from a week’s time up to an entire semester exchange. Also available in that location will be the Erie County Department of Health and Erie Maritime Museum. Two of the smaller zones will be environmental and spiritual. Environmental will have attractions such as What Should I Do with All This Junk? and Upcycling with Occupational Therapy (OT) while spiritual wellness will provide an opportunity to relax with some campus ministers and give a silent prayer. The Wellness Fair’s emotional zone will host a Tend the Zen Garden and a personal Gannon favorite, therapy dogs, along with off-campus partners in Safe Harbor Behavioral Health from UPMC Hamot and the National Alliance on Mental Illness (NAMI) for members of the community to be more informed. In the occupational zone, there are ways for students to fortify their future endeavors in a career with attractions such as Top 10 Ways to Fortify Your Wellness at GU, and Coffee, Conversations & Connections, allowing you to practice your communication skills with others. The physical zone is the largest at the Wellness Fair with vendors such as Erie Fitness Academy, LECOM Health, Metabolic Disease Associates and Proactive Spine Center. There is also an Obstacle course for those wishing to “Be a Ninja.” It will include campus partners such as GU Pathfinders, Gutless Girls and Metz. The last zone is social, which includes henna tattoos, a dunk tank, yard games and listen live from the Wellness Fair to 90.5 WERG, Gannon’s radio station. Many of the Gannon athletes and coaches will be there for meet and greets, as well as the Shuster Theatre. Mary Jean Taylor, director of university wellness, said the vendors represent a wide range of community partners with specialties in different areas of wellness. To ensure that every person on campus and every member of the Erie community can enjoy all the opportunities that the Wellness Fair has to offer, there are going to be two waves: Wellness at Work, which is running from 8 a.m. to 1 p.m., and Happy Hour, which is running from 4 p.m. to 8 p.m.